Ask fellow campers about "Golden Village Palms RV Resort " and nearby attractions. This is a large park with wide paved roads that make for easy access for back-in or pull-through sites. They have several price ratings for different quality of sites. A number of sites are occupied by permanent park models some of which have been there for a long time. The park is well maintained and you can see where improvements are made each year. The WIFI provided was normally okay during our stay. We stayed for a week @ their special 1 week rate. The only down side will bug a few people and that is the price of laundry. At $2.75 for a wash and $2.50 for a dry -- it's no wonder they require use of a credit card to pay! 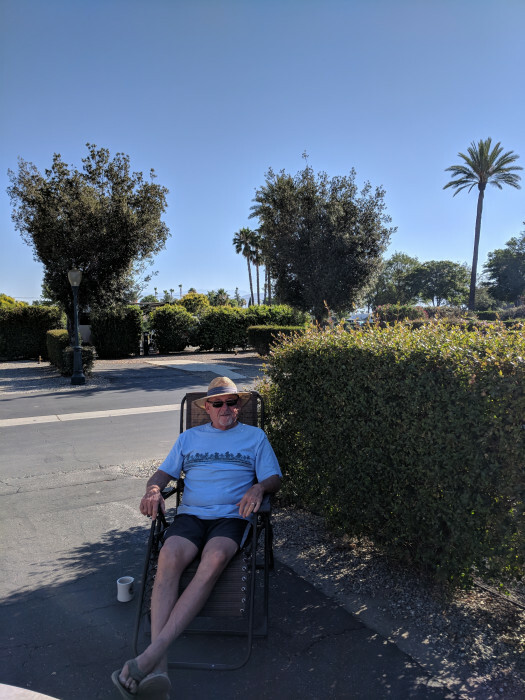 We camped at Golden Village Palms RV Resort in a Travel Trailer. This a beautiful park and very popular with snowbird RVers that stay for several months during the winter months. We have spent many winters there. The staff have been excellent, always trying to make our stay pleasant . The management is poor! They are not very hospitable and they are in the hospitality business. The general manager rarely speaks, even if you say "good morning". This park is not very pet friendly . They have raised the dog fee from $30.00 / season to $30.00/ month / dog. That is gouging the customers that have been loyal clients for many years! The Golden Village Palms has many rules and regulations that are not evenly applied, which is very frustrating . 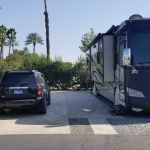 We camped at Golden Village Palms RV Resort in a Fifth Wheel. This is a popular winter destination for snow birds who enjoy club activities. It is an older park with established trees and vegetation but has a crowded feel to it. Our site was too narrow for our 40 foot class A: we had to park our rig half on the cement patio to allow room for our deep driver side slideout to clear the dividing shrubbery. The power source was from a shared post in the rear passenger side corner of the site. The cable tv outlet was there as well but not active. We didn't require patio space as this was a short "shake down" visit which met our needs. This site would not have been suitable for a long stay. The sites on the street we were parked on looked similarly small. We have camped here before and would return for a special occasion. The park is close to shopping and restaurants. We camped at Golden Village Palms RV Resort in a Motorhome. This is a destination park and would be a good place to spend a month or more. It looks like they have lots of activities available. We were only there for one night but would like to go back and spend some time. There are many park models in the park. We camped at Golden Village Palms RV Resort in a Motorhome. This park is over-priced and has way too many rules. They charge $60.00 for each dog if you stay a month or more. They have made it look great, but they discourage people from using the facilities. They rent out the clubhouse to outside groups and the people inside the park are excluded from using facilities at those times. If you have a problem with the electricity at your site, they tell you that your rig is the problem. We camped at Golden Village Palms RV Resort in a Cabin. We stayed here for three weeks while visiting friends that live in Hemet. Our visit was in August and this park was about 20 percent full. We had a nice quiet stay here. First week for first time visit was $169, then the standard weekly rate. This is a nice resort and the word resort is used correctly. This is a gated park. We had a site in the rear of this park. The site was wide and deep enough for our diesel pusher with four slides. The cement patio was large enough to park our car on and still have room for chairs and our BBQ. There was no shade but large shrubs separating the sites give a fair amount of privacy. Parking for our motorhome was on gravel. They do have a problem with ants here. If you do get ants just inform the office and they will have your site sprayed. Electrical 50 amp service was stable. Leg 1 - 122v and leg 2 - 114v. Water pressure was around 41 psi. During our stay we were without power for about 8 hours while annual maintenance was performed on electrical throughout the park. We were provided plenty of notice, so no problems. In September they are replacing all washers and dryers with units that will use a credit card. If you stay here for a month or longer you and you want mail delivery. You are required to get a post office box in the main building. Cost is $15 per month. We had one mail delivery here and were told very firmly that was our first and LAST free mail delivery and if we want anymore mail delivered here we would have to pay the $15 for a post office box. I'm using 'General Delivery' at the post office now. The pool area is very nice and resort quality. There are three pools and three spas centrally located at the main building. There is also a billiards room, laundry room, workout room, bath house, indoor shuffleboard all surrounding the pool area. Roads are paved and in good condition. Getting into your site with a big rig can be difficult if you are in an area with park models. Overall a very well maintained park. We camped at Golden Village Palms RV Resort in a Motorhome. Florida avenue seems to be the major shopping road in Hemet. There is a Home Depot just outside the gate to this park. Just about every major fast food and restaurants are located on Florida avenue. You won't go hungry here. The sites are all cement with only a few having trees. 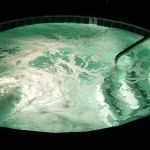 Stay close to the front and enjoy 3 pools and 3 spas; a putting green and two dog park areas (located in furthest corners). The pool areas are truly a resort. Apparently, the Canadians pack this place in the winter but summer was awesome and empty. 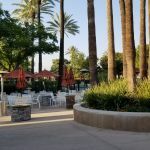 We camped at Golden Village Palms RV Resort in a Travel Trailer. We stayed here with a rally. This is a very nice park, but very expensive for what we were getting for the rally rate of $44 per night. Passport America rate is $28 per night, even in April. This is a resort with all the amenities, but the season ended on April 1, so there was not a lot going on at the park. The sites are level, but some are small length wise and side to side. Friends had trouble opening their slides due to bushes. Verizon signal was strong. The park WiFi worked well. Easily able to obtain satellite. My only complaint is the high price. We will not stay here again due to the cost. We camped at Golden Village Palms RV Resort in a Motorhome. Vinyards in the area. The park is located in downtown Hemet, so there were grocery stores, Walmart and other stores readily available. We stayed for four nights. We spent most of our time vising wineries in the area, so spent most days away from the resort. Our site was quite level. We had satellite access. The most remarkable feature of the resort is how involved residents are in activities: Volley Ball, Swimming, Exercise, Shuffleboard, etc. Staff were very friendly and helpful. 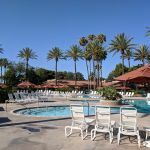 We would stay here again if traveling to the Hemet area. We camped at Golden Village Palms RV Resort in a Motorhome. Visit the many excellent wineries near to Temecula. Will stay again. Suggest interior sites for the most quiet. The long term guests all seemed friendly. The area seems to be trying to recover from nd times. We camped at Golden Village Palms RV Resort in a Motorhome. Close amenities. We went out of park during day, did not feel unsafe. This was a very nice RV Resort. I was impressed with how clean and well-kept it was. Landscaping was lovely. We had a pull thru site that must have been about 90' long. It was nice gravel and had a patio made with pavers. The pool area is very nice (3 pools and 3 hot tubs but all in the same area). I do wish to come back. My rating is a 10 but if there was a 9.5 I would say that because the only thing wrong was the WIFI did not work all the time. These RV Parks need to work on that! The park was close to shopping. It seemed quiet; however, we did go during mid April so many of the snowbirds had left. We totally enjoyed staying there. It was a nice place! We camped at Golden Village Palms RV Resort in a Fifth Wheel. Plenty of stores in the area including Sprouts. Second time here. Well kept Park. Nice pools and hot tub. All facilities were in great shape. Staff friendly and helpful. I will stay here again. 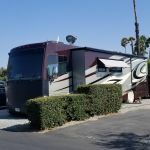 We camped at Golden Village Palms RV Resort in a Fifth Wheel. Lots of things to do here. From volleyball to golf outings. 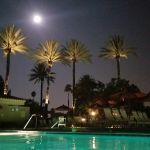 Central location to do day trips to Palm Springs or to San Diego or çlose by attractions. We saw an online special for $180 for one week so we joined some friends at this park. It is a very large park that really packs in the rigs. Very tight lot spacing. Some trees in certain areas of the park and a really nice large fenced in dog area. People that we talked to said they return each year not due to the park itself but because of the friends they have made there. There is ALOT of activities going on so it would be easy to make friends in this park. People seemed very friendly in the week we were there. 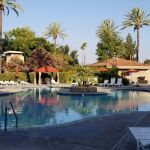 Very nice large pool area and pickleball courts. An amazing indoor shuffleboard area with stadium seating. One issue we heard a lot about - lots of bike thefts in the area including at the RV resort. Folks were recommending buying a huge chain to lock up your bikes or store them in your rig. 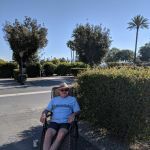 We camped at Golden Village Palms RV Resort in a Motorhome. Hemet has a lot of your basic stores and restaurants. There aren't a lot of attractions in Hemet itself but it is close enough for day trips to LA, Temecula wine country, Idyllwyld, Palm Springs. There is a nearby reservoir (Diamond Valley Lake) with a 23 mile bike trail that encircles the rim - fun day trip of moderate difficulty. This is a very nice RV Resort. We stayed there for 4 nites using PA for 3 nites and Good Sam for 1 nite for an average rate of $44. We got a pull-thru site, however it was at the end of the row (#833) resulting in hardly any room for our patio area. The other pull-thru sites had generous patio space. The park has a lot of amenities, 2 pools, 3 spas, pickleball courts, putting green, volleyball courts, a fittness center and shuffleboard. They also offer cable TV and WiFi. The park is located right in Hemet so it is close to shopping and restaurants. It is still quite at night. The wineries at Temecula are not far. Also it is a nice drive to Idyllwid up the mountain is fun for shopping, wine tasting and a bite to eat. We camped at Golden Village Palms RV Resort in a Motorhome. I had heard a lot about this place so decided to check it out. This might have been a nice place at one time but for the most part it is pretty ghetto. Apparently lots can be owned and at that point anything goes. Trashy lots, old rvs, roads and concrete in serious disrepair. One guy even had a pickup on blocks apparently overhauling it complete with oil and grease everywhere. Dogs runs are awful. The smell of urine takes your breath away. Most places set sprinklers in these areas to freshen the area but not here. Sites are a hodgepodge of gravel and concrete. Utilities ok but internet awful any time of day. Lots of little houses on lots, many with for sale signs so that might tell you a little bit about the place. The overall facility is huge but over a third of it is unused as it appears they try to cram everyone; long term and overnighters in one end. They do have lots of activities. We won't be back. We camped at Golden Village Palms RV Resort in a Motorhome. Crowded in the Winter months with Snowbirds. Hot summer climate with fewer campers. You're able to move about the park as other spaces become available for longer term stays. Great breakfast available at Mia's Country Kitchen in the strip mall across from the park entrance. Lots of fast food restaurants here. Not many nicer 'sit down' restaurants. Bicycle theft at this park has been a big problem, so if you bring your bikes, be sure to lock them up SECURELY! San Jacinto City Museum, Estudillo Mansion, Hemet City Museum, Biking and hiking Diamond Lake Valley, all great things and much more in the surrounding area. There are some stores and restaurants nearby. Temecula is a shopping mecca and it's not too far away. Good shopping and golf nearby. 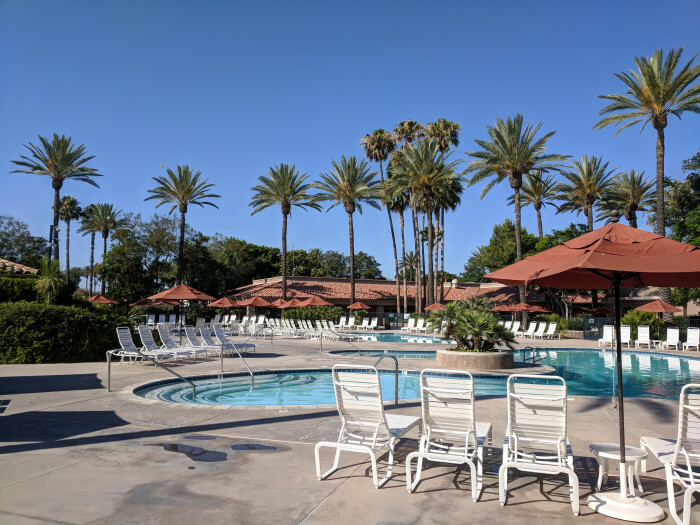 Are you affiliated with Golden Village Palms RV Resort ?